The Pimm's Cup is one of my absolute favorite drinks. It happens to be the official drink of Wimbledon and they make a really fantastic one at The Napoleon House in New Orleans. A little moody drink with the most fabulous garnishes, I am always a happy lady when a Pimm's Cup is in hand. I particularly fell in love with this drink while studying at Oxford. 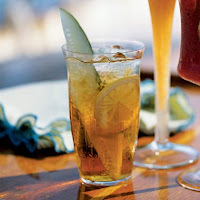 The original recipe remains a mystery but below you can find a modern day Pimm's Cup recipe. Garnish- cucumber curl, mint leaves, borage leaves (an herb that taste like cucumber), apple slices, orange slice, lemon slice, strawberry piece or basically whatever you want that is pretty and refreshing. Pour the liqueur, lemonade and 7up into a highball glass filled with ice cubes, stir well and garnish. This entry was posted on 11:52 AM and is filed under cocktails , happy hour drinks , pimm's cup , southern cocktails , The Napoleon House . You can follow any responses to this entry through the RSS 2.0 feed. You can leave a response, or trackback from your own site. Thank you for stopping by my blog and commenting! I love your blog as well and I added myself as a follower! As I was reading an earlier post with a cocktail recipe and was wondering when the pimms cup would make its way on here!! Pimms and punting.... what a summer! !